Provide a short objective describing the type of job/company you were seeking. List the companies/job positions in chronological order. Provide a brief job descriptions (emphasis on BRIEF) and present everything on one-page. Print the resume on nice a quality paper stock (preferably white linen I think). Over the years, resume writing has had no choice but to evolve to keep up with changing hiring practices. Unfortunately, many of you are still receiving and following outdated advice that just doesn’t work in this job market. I know because I’m still receiving requests from clients to squeeze five-10 years of work experience into a single page resume that is expected to clearly communicate the job seeker’s expertise, skills, and accomplishments. These same people that believe in the one-page myth so strongly they insist on deleting and downsizing their career experience to a one page document are also the same people that contact me beyond frustrated by a fruitless job search that’s yielded no results to date – not even a single offer to interview. These folks are being misled into believing that recruiters, hiring managers, and HR professionals will not consider a resume that is two-pages long. And that’s just not true. Many times this misguided advice comes from people who genuinely mean well – parents, co-workers, university advisors… I’m disappointed by how often I’m contacted by recent grads who are still receiving this type of outdated resume advice from college professors and advisors; but that’s a topic for another day. These recommendations usually come from people with no connection to the employment world or understanding of how drastically hiring practices have changed in just the last five years. They believe their way is the right way because it worked for them back in 1998 when they were job seekers. And by the way – there are even some recruiters known for proclaiming their preference for a one-page resumes. 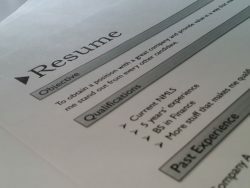 However, when hiring managers and HR professionals are surveyed about whether a resume should be one or two-pages long, the general consensus is that a resume should be “as long as needed to convey the applicant’s qualifications.” Meaning it needs to be long enough to accurately communicate what the reader needs to know about you to determine whether to invite you for a job interview. Period. Since nowadays resumes are usually reviewed online, length is less of an issue than if they were being viewed in a printed format. Also, whenever you upload your resume on a company’s website or an online job board, it’s automatically processed and electronically screened through a company’s ATS system which does not recognize page numbers. If only a few lines of your resume spills over onto a second page, it’s better to edit/streamline the resume until it’s one-page in length. Try adjusting the headings, margins, and spacing if necessary. If your resume ends up being two-pages long, make sure the most important information is on the first page. Don’t be afraid for your resume to go to two-pages or longer if your experience warrants it. For example, it’s not unusual for senior-level executives and those in the IT, R&D, and academia, science, and legal fields to have resumes that are three or four-pages long . If you’re a traditional college student or recent grad with less than three-years of cumulative work experience, you may be able to easily fit all of your experience on one-page (but don’t be afraid of a two-age resume if you need it though). Make sure every word listed on the resume is relevant to the type of position you’ll be targeting in your job search. If it’s not relevant, or “fluff,” leave it off.